Congressman Ami Bera represents California’s 7th Congressional District. 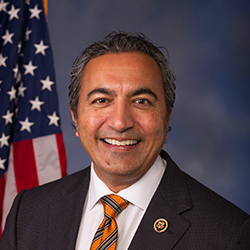 Rep. Bera serves on the House Committee on Foreign Affairs, including as Chair of the Subcommittee on Oversight and Investigations, and is the Vice Chair of the House Committee on Science, Space, and Technology. Before being elected to Congress, Rep. Bera practiced medicine, served as Chief Medical Officer for Sacramento County, directed care management at a seven-hospital system, and taught medicine at the University of California, Davis.